September 6, 2017 – Launch is the most strenuous part of a satellite’s life. To survive the extreme sound wave pressure and pounding vibrations generated by more than 700,000 lbs. of thundering rocket thrust, spacecraft need a solid, reliable design if they hope to arrive operational on orbit. On July 13, Lockheed Martin’s second, fully-assembled GPS III space vehicle (SV) completed a realistic simulation of its future launch experience and passed this critical acoustic environmental test with flying colors. During acoustic testing, the GPS III SV02 satellite was continuously blasted with deafening sound reaching 140 decibels in a specialized test chamber equipped with high-powered horns. For comparison, that is about as loud as an aircraft carrier deck and human hearing starts to be damaged back at about 85 decibels. The test uses sound loud enough to literally shake loose anything not properly attached. The GPS III SV02 satellite is part of the U.S. Air Force’s next generation of GPS satellites and will bring critical new capabilities to the warfighter. GPS III will have three times better accuracy and up to eight times improved anti-jamming capabilities. Spacecraft life will extend to 15 years, 25 percent longer than the newest GPS satellites on-orbit today. GPS III’s new L1C civil signal also will make it the first GPS satellite to be interoperable with other international global navigation satellite systems. 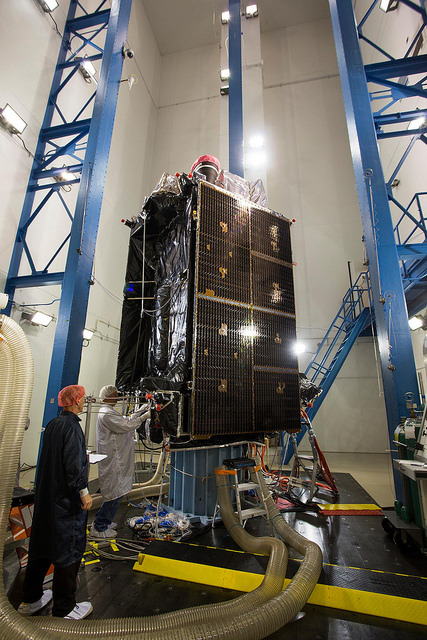 GPS III SV02 is Lockheed Martin’s second GPS III satellite to successfully complete acoustic testing. The company’s first satellite, GPS III SV01 – which is in storage awaiting its expected 2018 launch – completed acoustic testing in 2015. The GPS III SV02 satellite is now being prepared for Thermal Vacuum (TVAC) testing this fall, where it will be subjected to extreme cold and heat in zero atmosphere, simulating its on-orbit life. The satellite is expected to be delivered complete to the Air Force in early 2018. GPS III SV02 is the second of 10 GPS III satellites Lockheed Martin is contracted for and is assembling in full production at the company’s GPS III Processing Facility near Denver. The $128 million, state-of-the-art manufacturing factory includes a specialized cleanroom and testing chambers designed to streamline satellite production.